That would be the first time the ‘w’ word has appeared in a while. So long sweet summer…so long, you will be missed. :'( Since whh-wiin…winter is approaching, we often get many questions from concerned pond owners wondering what to do with their fish, if they need to do anything in particular to their pond for winter…many different questions. So we’ll start off with the basics and see how you can get your Grand Rapids pond ready for winter. Removing leaves and debris from your pond is a very important first step. When leaves and debris have a chance to collect at the bottom of your pond, decomposition will start to happen, which can cause problems in your water over winter, especially if you have fish. Be sure to remove as much of the leaves and debris that you can, but be careful not to turn it up too much. The decomposing leaves have existing bacteria present, and when these leaves are stirred around, it can cause an imbalance in your water (which will be harmful to your fish over winter). The best way to curb the amount of fallen debris into your Grand Rapids pond, is to install a net. The net will catch most of the fallen material so it can’t make it to the bottom. With an ecosystem pond, plants are a necessity to keep everything in balance. When fall arrives, many plants start dying back, so make sure to remove any dead plant material. If the dead plant material is not removed, it will eventually find it’s way to the bottom decomposing with the rest of the fallen debris. Fall is also a great time to prune and divide your pond plants. Typically if your pond plant, or other perennial, blooms in spring and summer then fall is when you want to divide. And if your perennial blooms in fall, then spring is when division should occur. Fish hibernate over winter, going into a sort of dormant state, where their digestive system stops and they move much slower. So, because their digestive system slows way down, you will need to stop feeding your fish when the water temperature drops below 55 degrees. Even if the temperature goes up for a few days, do not start feeding your fish again. 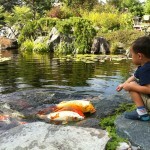 Koi fish do not have stomachs, but have a digestive tract. When Koi fish are fed when their digestive system is shutting down, the food they intake will end up ‘stuck’ in their digestive tract. The food can rot there, which will lead to death. So, pay close attention to the water temperature in your pond, and remember when it goes below 55 degrees, stop feeding. These are just a few quick steps you can take to get your Grand Rapids pond ready for winter. 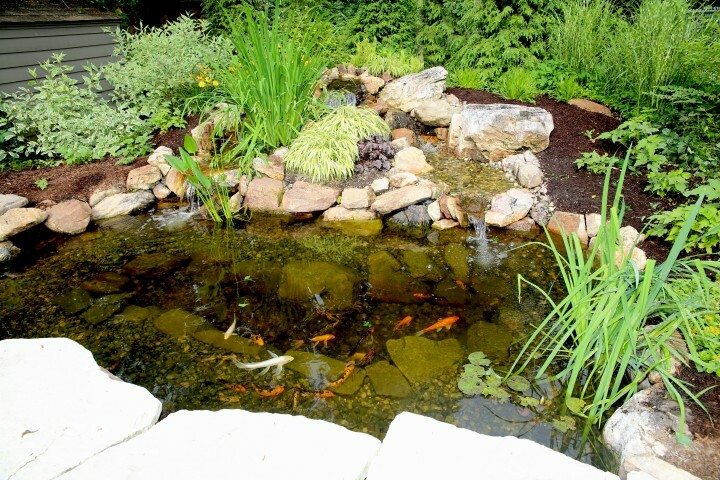 As always, we recommend two pond cleanings; one in spring, and the second in fall. This not only gets your pond ready for winter, but it also helps to see if there are any existing or potential issues you may be unaware of. Always be sure to contact a professional for your pond needs. R&A Water Features & Landscaping is the premier pond and landscaping company in Grand Rapids, specializing in the design, creation, and maintenance of outdoor living spaces. Check out some of our recent projects to inspire you for your next project and give us a call when your ready to begin!